Last year during the month of December I started an annual series at The Landing...Christmas Cookies. Each Wednesday night for three weeks I feature a fresh homemade Christmas Cookie recipe and one of my favorite bites of scripture. At the end of the three weeks, each person that has been a part of the series gets a booklet of the messages and the recipes of all of the edible creations we have sampled while we were taught the Word. It is one of my favorite times at the church. The bible tells us in Psalm 34:8,"Taste and see that the LORD is good; blessed is the man who takes refuge in him." We are instructed to "meditate" on the Word of God. To meditate means to go over and over it in our minds or to ponder. Another image is looking at it like a cow chews its cud. The goal is to get each and every nutritional benefit from it. We must allow it to grow within us so that it can go out from us. His Word was sent to heal. His Word will not ever fall short of accomplishing its purpose. Another benefit of this series is that the church smells like Christmas Cookies! The aroma or fragrance of the believer should be as sweet! We should not only brighten up a room by being the light but we should also bring a pleasing smell to all around us. Are you allowing the Word of God to be enticing to others through you? 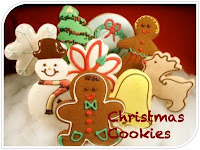 Do you have some favorite Christmas Cookies? How about some bite size truths from the Word of God? Let the Word grow in you mightily this month!